Today was the Carolina Wrens' turn to get their babies out of the nest box -- well actually they used a plastic gourd for this nesting. I was just minding my own business, leaving for work, backing the van out of the garage and noticed a lot of wren chatter. Looked in my side mirror and saw something more stout than a leaf drop down behind my car. 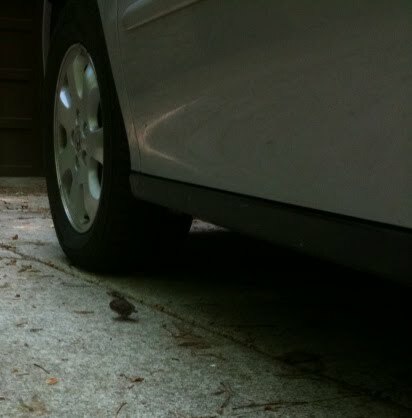 I got out to find this little guy: I actually had to "chase" him around a bit in orde to get him out of the driveway. No sooner did I get him back with his sibs, I turned around and saw this! 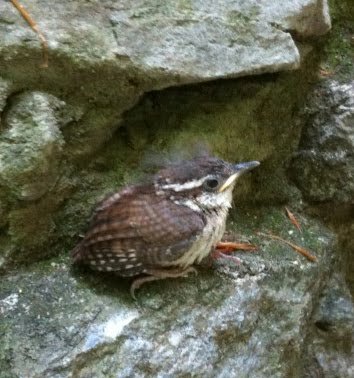 Another little Wren that needed to be moved along. This one was a bit more fiesty and it took a couple more minutes. All was well though. I cornered him and got him up into the holly bush. Happy little Wrens. 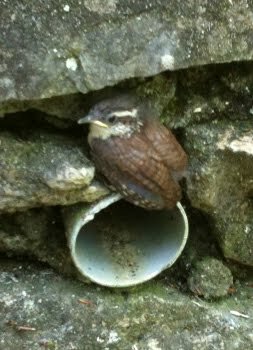 They seemed a bit under-developed for fledging and I hope that they weather the coming weather ok.